A CASH machine was stolen in Castleblaney, Co Monaghan earlier this morning. 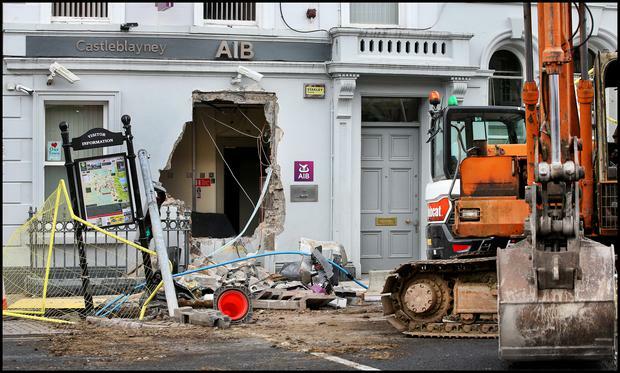 Gardai are investigating after the ATM was removed from the wall with a digger at approximately 3am. The ATM was then loaded onto a trailer, which was towed by a dark coloured jeep. The jeep left in the direction of the Oram Road. It is understood that the digger remained at the scene this morning. A number of routes through Castleblaney town centre remain closed this morning as a result of the incident. AA Roadwatch have warned motorists that Main St, Shercock Rd, York St and Muckno St are expected to remain closed until midday. On Monday, the PSNI appealed for information after an ATM machine was stolen in Aghohill, Co Antrim. Police called for anyone with information to come forward after a “spate of ATM thefts across Northern Ireland”. “As in all of these ATM thefts, the actions of these criminals have not only caused immediate financial harm to the business that was targeted, but they have understandably caused fear in the community and impacted upon a vital service many local people rely on,” Detective Chief Inspector David Henderson said.